Synopsis: Marwa and Ahmad live in a country where there is war. They continue to go to school, play soccer and don’t think very much about war because it seems far away. Then one day a planes fly over their homes and drop gray bombs. They are frightened, but after a few days they forget and begin to laugh and play again. 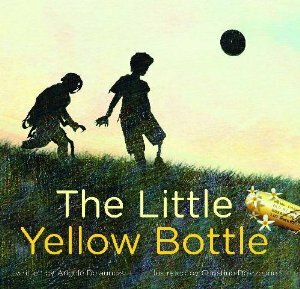 One day Marwa and Ahmad are kicking the soccer ball in the forest and Ahmad spots a shiny yellow bottle. He picks it up to show Marwa and it explodes. Both children are seriously injured. Marwa wakes up to bandages. Ahmad has lost two limbs. Only time and a very special visitor brings hope that will give Ahmad the courage to live and walk again. Why I like this book: This picture book is for older children. It is written in a manner that is appropriate for children. I debated about sharing this book, but then decided that is a story that needs to be shared with older children. It is a story about how war affects the physical and emotional lives of many innocent children around the world daily. Angele Delaunois, the author of over 40 books, tells this heartbreaking story through Marwa. Her words are simple and powerful. Marwa’s goal is to “honor the courage of Ahmad and all the children in the world like him.” “I hope you won’t forget them.” Christine Delezenne uses a blend of textures, drawings and collage to capture the action and emotion of the story. I recommend the book for both school and public libraries. Posted on March 15, 2013 by Patricia Tilton •	This entry was posted in Angele Delaunois, Children's Book Review, Handicap International and tagged Chronic Pain, Courage, Disabilities, Friendship, Multicultural, War. Bookmark the permalink. Yes it is heartbreaking, but and every day reality for many children living in war-torn areas of the world. We are sheltered here, but our kids see these images on the news. The is a good resource to use with an older child. Wow! The video is very impressive. Thank you for your response. I debated whether to show it, but I thought it gave a sense of the story. We want to raise compassionate children who want to tackle problems in the worlds. Landmines was a priority for Princess Diana. This story is all too true for me! We met a boy like Ahmad back in 2002 in Afghanistan. I’ve shared a bit of his story and a link to your review on our web site. The United States needs to join other nations in a treaty banning land mines, including cluster bombs. A huge percentage of the bomblets dropped during campaigns fall to the ground without exploding, leaving places littered with little yellow time bombs just waiting for some innocent passer-by to be maimed or killed by them. Is this an appropriate story to tell young people here in America? Absolutely! I share what happens when you let young people know about injustice on my page linking to your review. Thanks for reviewing this book and helping spread the word. Craig, I thought I might hear from you. I was so moved by the story you wrote about 8-year-old Narisula, a boy you met in Afghanistan. Thank you for sharing his remarkable story with us. I hope others will click on the link you shared. Sounds like the trauma of his scars within are deeper than his physical injuries. Unbelievable that the color of the food packages that the US dropped for civilians in war areas were the same color as the cluster bombs. Glad that changed years ago. I agree with you that this is an appropriate book to share with kids in America. Thank you for linking my review to your site. I also remember your sharing the story of a 12-year-old Canadian boy, Craig Kielburger, who read about the death of a boy, Iqbal, who spoke out about child labor in Pakistan. Craig was moved into action and eventually founded Free the Children — an organization about kids helping kids. That was another reason I shared this book. I appreciated Craig sharing his experiences and am very glad you chose to share this book, Pat. Shared in the right context and with sensitivity, this story can be a great starting point to discuss the war dangers/horrors that many children face world-wide. Thank you for your comments Joanna. I always appreciate Craig sharing his experience. I believe it is treated with sensitivity and is a starting point to discuss the dangers other kids face daily in the world. Kids are compassionate. Talk about the elephant in the room – – What a great tool to teach empathy this would be! You are SO right about kids being compassionate. Thank you for sharing this book with us. I’m glad you liked the book Barbara. Yes I think it is a great way to teach empathy to kids and you would know! Wow. This sounds like a very powerful book, Pat. Certainly older children should have the opportunity to know that not all children have the same experiences. A book like this would be valuable in teaching empathy and compassion. I would very much like to read it myself. Thanks for sharing. Susanna, it is a very powerful book. Yes, I agree. I think children need to learn that children around the globe have different life experiences. It’s a great way to teach empathy. Such a sad reality that must be shared. So much of the world is at war. So many childhoods are stolen because of war. The world needs to protect its children. The loss of innocence os something that makes me forever sad. Niamh, I thought of you as I read and reviewed this book. I know you have seen first hand so much suffering among the children of the world. The loss of innocence is the tragedy. I don’t know if you read the link to the artcle Craig posted below, but he writes of his enoucnter with a child that nearly lost his limbs to a cluster bomb. It is too terrible to bear and haunts my soul on a daily basis. Niamh, you’ve seen it first hand. How do you ever get over such images — sharing it as you do in all your creative writing and musical endeavors. I hope we reach a point in our humanity that the pain of what we know and see finally makes helping the innocent who are suffering a real priority. Many are, but we need a larger mass of compassionates. That children should suffer so, and all for the ego and greed of adults, is horrific. This is a beautiful story told with wisdom and compassion. I also pinned it on my Book Review and Teacher/Classroom Pinterest boards. Margot, thank you for pinning my review on the teacher Pinterest boards. It is a tragedy that so many children have their innocence stolen by war. That’s why I review stories like this, hoping they reach the right hands. This is an important book. Children need to know that war is not just a TV show , movie or video game. It is very real and many innocent lives are destroyed. I hope teachers will use this in the classroom as it could be the start of valuable discussions. Thanks so much Patricia for bringing this book to our attention. Darlene, I must say I didn’t know how teachers and parents would respond to my review of war in a picture book. But, I feel also feel strongly that kids need to know that war is real. Yes, I’m hopeful that this book will be ued in the classroom. It is an important subject to discuss! Thank you for your comments. Wow. This story is so sad. It is sad to think that things like this actually happen. I love the cover of this book and was quite surprised by the story! What a sad, sad one. But I think one that probably needs to be told. Kids here in the US have no idea how very lucky they are. Thank you so much for commenting. The book has an important story for children. Kids are compassionate and want to help other kids. I think we’re laying a foundation or their future in telling them these stories. That’s very true Ms Tilton! Kids do like doing and giving and helping. A story like this could lead to some really positive things.